The Financial Times reported on September 30th that the European Commission has decided to open a formal investigation into whether Apple received illegal subsidies (“state aid,” in EU-speak) from Ireland going as far back as 1991. The FT quotes “people involved in the case” as saying that this can cost Apple billions of euros. What the decision technically does is establish what is known as an “Article 108(2)” investigation, which means that the Commission has concluded from its preliminary investigation that state aid has been granted in violation of the EU’s competition policy rules. It is therefore opening a more comprehensive investigation. It is worth noting that if the Commission opens an Article 108(2) investigation, it almost always decides that illegal state aid was given. The only recent exception I can think of is state aid from Poland to relocate Dell computer manufacturing from Ireland in 2009, and I actually think the Commission should have ruled against that as well, as I discussed in my book Investment Incentives and the Global Competition for Capital. As I speculated in June, one issue raised by the Commission is Apple’s “nowhere” subsidiaries created under Irish law. Both Apple Operations Europe (AOE) and its subsidiary, Apple Sales International (ASI), are incorporated in Ireland, hence not immediately taxable by the United States until they repatriate their profits to the U.S. However, they are managed from the U.S., which by the provisions of Irish tax law makes them not taxable in Ireland. It is these provisions that are at issue in the case. See, in particular, paragraphs 25-29 of the decision, especially paragraph 29: “According to the information provided by the Irish authorities, the territory of tax residency of AOE and ASI is not identified.” Richard Murphy suggests today that these corporate provisions account for the largest proportion of Apple’s tax risk. What is especially important for this investigation (and the similar ones of Starbucks and Fiat) is that if the Commission finds that state aid was given, it was never notified in advance to the Commission. The state aid laws require that any proposed subsidy be notified in advance and not implemented until approved. Ever since the 1980s, the penalty for giving non-notified, illegal (“not compatible with the common market”) aid is that the aid must be repaid with interest. Since this alleged aid was not notified, and will probably be found to be incompatible with the common market, Apple will be on the hook for aid repayment. As I reported in June, this would not be the first time the Commission has used the state aid law to force changes to Ireland’s tax system. In 1998, it ruled that Ireland’s 10% corporate income tax for manufacturing was specific enough to be a state aid. Ireland then reduced the corporate income tax to 12.5% for non-manufacturing firms, while raising it to that level for manufacturing (mainly foreign multinational) companies. If the Commission rules against Ireland and Apple, this will send a signal that the European Union is going to take tax manipulation very seriously with all the tools at its disposal. It would be especially great to see one of the pioneers of arcane tax avoidance strategies taken down a notch. For Ireland, at least there would be a small silver lining from losing this case: Apple’s aid repayment would go to Ireland and help reduce its budget deficit. Cross-posted from Middle Class Political Economist. No sooner do I comment on the difference between tax planning and tax avoidance than Richard Murphy points out that several multinational corporations are having their tax deals looked at for potential violations of the European Union’s state aid rules. As The Guardian and The Wall Street Journal report, there are three cases currently under investigation by the European Commission, but more investigations may be opened in the near future. First is Apple in Ireland. What a surprise! It has a subsidiary it claims is taxable nowhere, incorporated in Ireland but managed from California, which under Irish law makes the subsidiary not subject to Irish tax. Of course, since it is incorporated in Ireland, Apple can defer its U.S. taxation on the unit’s profits until it repatriates them, if it ever does so. Two issues are relevant here: Did Ireland’s creation of this class of entity provide firms with state fiscal aid? Second, did Ireland negotiate a special deal with Apple giving the company a tax rate far below Ireland’s already low 12.5% corporate income tax rate, as Apple CEO Tim Cook testified last year before the U.S. Senate, under oath. In fact, according to the New York Times, the company paid ” as little as one-twentieth of 1 percent in taxes on billions of dollars in income.” One source quoted by the Times said the company saved $7.7 billion in taxes in 2011. If the tax saving in Ireland is deemed to be state aid, the Commission would have to determine two things: Was it notified to the Commission, as required by the state aid rules? (No, or we wouldn’t be having this investigation in the first place.) Is the aid compatible with the common market, and thus allowable? My guess is that the Commission expects to find that fiscal aid to Apple and others (see below) distorts competition, and hence is not compatible with the common market. It is worth remembering that Ireland has a 12.5% corporate income tax rate, rather than the 10% rate it had for decades, precisely because in 1998 the Commission found that the 10% rate was state aid and was not compatible with the common market (Competing for Capital, p. 95). So the use of the state aid rules to attack arcane tax provisions is nothing new for the Commission. The second case is Starbucks and possible fiscal aid from the Netherlands. I have already reported on how the company happily tells investors how profitable its British subsidiary is, but books a loss in the United Kingdom and had no tax liability for 14 years. As discussed then, the issue ultimately revolves around transfer pricing between the “loss-making” U.K. affiliate and the Dutch subsidiary which holds Starbucks’ intellectual property and collects 6% of revenue as royalties, plus transfer pricing into Switzerland. Theoretically, the case could also expand to the Swiss transfer pricing as Switzerland is also subject to state aid rules as part of its free trade agreement with the European Union. Finally, the Commission is investigating whether Fiat receive state aid from Luxembourg, again as part of its tax treatment there. All three of these cases demonstrate what I emphasized in my last post, namely that tax avoidance increases tax risk, whereas tax planning does not. It also underscores a point I made in Competing for Capital that the Commission can be quite creative in finding ways to attack fiscal provisions under the state aid rules. It’s good to see that the Commission is actively attacking corporate tax avoidance; it would be great to see equal creativity and perseverance on this side of the Atlantic. Is ‘overbanked’ going to be a common household word? Go no further than the following two charts to understand why markets freaked out over Dijsselbloem’s comments. Europe is way overbanked and vulnerable to financial sector shocks. Even in the so-called “safe haven” Switzerland the banking system is outsized relative to the country’s GDP. Compare the relative size of UBS, for example, to the largest bank in the U.S., JP Morgan. Nuff said. While we are busy paying attention to the 550th edition of Republican-caused fake crises (aka the sequester), a much more real crisis is brewing in the Eurozone. Richard Field at Trust Your Instincts flags a Reuters report that that Eurozone regulators are strongly considering a proposal to make not just investors in Cyprus banks pay for part of their bailout, but bank depositors as well. So, for example, Greece has imposed austerity equal to about 15% of potential GDP, and seen its actual GDP shrink by about 18%. Despite the clear failure of austerity policies in the eurozone and Great Britain (where 9 months of recession were followed by one quarter of growth but a renewed slump in the last quarter of 2012, and Moody’s just downgraded the country’s debt), Republicans are still trying to impose budget cuts on the country that we voted against in November. As I discussed then, the sequester’s discretionary budget cuts will be unambiguously bad for the middle class. Now, Republicans are trying to convert the defense cuts of the sequester into further slashing into middle class programs, while President Obama has offered to convert Social Security’s inflation adjustment to so-called “chained CPI,” which will slowly but relentlessly cut into benefits year after year through the magic of compounding. According to Dean Baker at the link above, the reduction would be about 0.3% per year, so benefits will be 3% lower after 10 years, 6% after 20 years, etc. European Daily Catch: Know Your Consumers Today’s European Daily Catch compares the aggregate implications of the reported January 1-point rise in French household confidence to the reported January stabilization of Italian consumer confidence. Specifically, French consumers could be ‘happier’ but that doesn’t necessarily mean they’re spending more, while Italian household confidence translates rather directly to aggregate spending patterns. Domestic demand is a large contributor to GDP growth in both Italy and France. Therefore, inferring patterns of aggregate consumption from higher frequency leading indicators, such as confidence, is important. Confidence measures lead real retail sales numbers, and real retail sales lead the quarterly real consumption patterns. Annual real retail sales growth has a reasonably high correlation with aggregate consumption (the ‘C’ of Y=C+I+G+NX) in both Italy and France, 69%; so gauging real retail sales from consumer confidence could potentially be useful. …but it’s not in France. See, with a correlation of just 38%, household confidence is a terrible coincident indicator of real retail sales and adds practically no predictive value for aggregate consumption or GDP forecasting. French consumers could be just miserable and still post relatively healthy retail sales and aggregate consumption numbers. …and it is in Italy. When Italians are depressed (not confident), they spend less. And boy are Italians depressed. The same series, consumer confidence and annual real retail sales growth, has a very high correlation in Italy, 76%. The implication is, that with confidence running 12.5 points below its 2000-2012 average I do not expect real retail sales to rise above the current 4.9% annual decline in November (CPI-adjusted). Given the recent downtrend in Italian consumer confidence, the likelihood of a December decline in real retail sales is high. But even if it did stabilize at current levels, Q4 real retail sales are running 2.5% below Q3 sales. Therefore, household consumption is likely to decline in Q4, and quicker than its 0.2% drop in Q3. So the moral of today’s European Daily Catch is when it comes to confidence indicators, know your consumers. Unhappy Italian consumers make poor spenders, while unhappy French households may very well hit the shops. Domestic demand in Italy is shaping up poorly. In other words, in FT World, privatizing the profit and socializing the risk is A Great Idea that deserves the full support of the government. Start from Silliness and the Product is…? Assume Tom Friedman is correct. How do you then conduct war? Why, economically, of course. I mean, you can do it the stupid way: spend a bunch of your capital, get a lot of your people with potential for economic growth killed, and develop the enmity of those you battle, win or lose, but no one would be stupid enough to do that these days, would they? Assume you want to take over a country or bunch of countries. What’s the optimal way to do it? You start with countries whose economies together are larger than yours, but where each one individually is smaller. This gives them a sense of security. Dun them to within an inch of their life at the first opportunity after reaching a critical mass. The long term consequences of Germany’s successful push towards austerity have yet to play out. However, initial results from the Irish case would suggest two lessons. The first is that the contradictions within Germany’s policy towards Europe are leading to bad policy. The second is that as a result, Germany is likely to receive the political blame in target countries both for the economic pain that its mandated measures are causing, and for many of the adjustment pains that they would surely have suffered in any event. Germany’s asymmetric power is reshaping European economic politics in a direct, and arguably even a brutal fashion. It is not clear that German politicians and economic policy makers have any appreciation of the resentment and hostility that they are likely to incur as a result. New types of war may require new weapon, but they appear likely to produce the old results, though possibly with human capital devalued instead of outright eliminated. It is left as an exercise whether the model of France 1918-1939 is preferrable to the PIIGS and Belgium 2010-??? *As an aside, that route is completely eliminated, simply as collateral damage, by the GOP spending cut proposal discussed here. Good thing their constituents don’t depend on the U.S. for anything. **While we’re at it, I would like a pony, of course. Spent the past few minutes reading Alea. jck notes that, over the past five years, the Pound has grown in importance at the expense of the yen and that the Euro has done the same against the dollar. If this goes against your memory, you’re not part of the IMF. Note: Banks and government debt rollovers amount to €210 bln for 2011, €15 bln lower than in 2010, you would never guess that reading the funny (pink) papers. Somewhere, an FT editor is reading that and cheering that they’re on holiday until the 4th. With thanks to Felix Salmon for arranging the invitation. There’s an episode of House where he has to get rid of one of the people for his new team. By the end of the episode, the sharpest person in the group has said everything that we would have expected to hear from House—and is therefore summarily dismissed, since hearing one’s own opinions being spoken by someone else is less useful than being challenged. I had a similar feeling with George Soros’s conversation last Wednesday morning with Chrystia Freeland, sponsored by Reuters and held in the NASDAQ building that, er, graces Times Square. So what follows isn’t everything Soros said so much as what he said that either (1) you wouldn’t already know from reading this blog or Paul Krugman or (2) added details or touched on an interesting issue. UPDATE: Krugman finds another similarity between himself and Mr. Soros. Key to this shift has been the growth of bilateral relationships. He noted obliquely that these developed in part because many governments—most especially the Chinese, who have been “the great beneficiary of globalization”—do not want to change their capital controls, but sees them as facilitating the new paradigm. He expects that the next move will be that Hong Kong (with the HKD remaining independent of the RMB) will become as London did in the 1960s and 1970s, the intermediary of choice for the growing market (now China, then Europe). There is a strong need to increase Chinese domestic demand, which he rightly expects is being partially facilitated by the recent wage increases. While there is a need to shift from the previous US-Chinese symbiotic relationship (essentially, bonds for exports), Mr. Soros is “not sure there will be” further advancement in that relationship without greater domestic Chinese consumption. He declared that the Chinese economy has become “the motor” of the world economy, but also noted that it is a smaller motor, so the world economy is not moving so fast. But all is not bread and roses in Soros’s view of China. An Indian journalist sitting next to me asked the obvious question: Has being a democratic country “hamstrung” India as compared to China? Soros came back to his key theme of the need for growth in Chinese domestic demand, noting that the Indian economy is more stable precisely because there is now domestic growth—growth that will be facilitated in China only as that State evolves both politically and economically. He noted that the Chinese people, to date, have been willing to accept limits on their individual freedom for its benefit in growth, but he does not see other countries being willing to accept such limits on their own freedom to support China’s growth. If I ever had any doubt that Soros is a more devoted Popperian than I, it was eliminated in that moment. Again, he looks to the Chinese as an indicator, who started putting their money—you know, that 4 Trillion RMB stimulus and the revenues that have followed it—into the EUR as soon as it reached around 1.20. The Chinese bought the EUR, the Chinese bought Spanish bonds, the Chinese stabilized the market. The Chinese did something no one else can do for them—bought another currency on the open market. And this is the key to understanding Soros’s attitude toward Japan. You think this is easy, realism? The Japanese are correct to worry about their currency, Soros notes, because, while the RMB is the strongest currency in the world, you cannot own it because of capital controls that the Chinese government maintains because they do not want to have both rising wages and an appreciating currency in their export-based economy. Accordingly, per Soros, any appreciation of the RMB “has to be done in an orderly manner.” In the meantime, the Japanese did the only thing they could. As a matter of handling the banks through the crisis, Mr. Soros noted that the Administration should have injected Equity into the banks, but notes that he believes the Obama team found this politically unacceptable. The result is that the government effectively nationalized the banks’s liabilities and “allowed” them to “earn their way out of that hole,” through practices such as increasing consumer credit card rates. The biggest fault he found with the Administration’s approach to the crisis is that they depended on the “confidence multiplier” to make recession shallower and shorter than it otherwise would have been. The problem with a confidence multiplier is, of course, that when the results do not match the expectations, the “multiplier” becomes a disappointment, and therefore a drag on expectations going forward. Mr. Soros described this as what happened. If this scenario is true, then the decision not to ask initially for a $1.2T stimulus, with a chance to end up with a better mix and higher absolute amount of actual stimulus funding, will go down as the tombstone for the Administration, not “just” a spanner in the possible continuation of the Administration’s economic team (h/t Mark Thoma on Twitter). But, hey, the recession has been over for more than a year, so things are getting better, with the upcoming elections more resembling the signpost of 1982 than 1932. At least in some timestream. This one was pulled all over the place, so it should come as no surprise. Gold is, per Mr. Soros, the only active “bull market” right now. He is also not optimistic about the ending of that market. Gold is “the ultimate bubble”—may be going higher, but is certainly not safe and is not going to be forever. I’ve left out a few things, including the roundelay that resulted when one journalist attempted to discuss Mr. Soros’s firm’s holdings in a company he said he didn’t the firm owns. But in general the feeling one gets when presented by Mr. Soros the person is that he is an optimist, perhaps incurably so. Things are rough, and they will probably continue to be rough for a while, but in the longer term, things are getting better for all. I’m guessing he won’t be speaking at The March to Keep Fear Alive. But Mr. Colbert—let alone his predecessor at the Washington Monument—would do well to book him as a guest. 1. In a recent article you announced that the next cycle of crisis in Europe will be determined by the struggle for exports. Does that mean that the country which lags behind in this struggle for exports will suffer from falling wages? Rebecca: What I meant was that the Eurozone might find itself in a “race to the bottom”. The prescript coming out of the IMF and the European Union is one of harsh and deep reductions in nominal income (wages) and prices in order to reduce relative prices enough to drive export income. Normally, downward pressure on internal prices via recession occurs alongside a sharp devaluation in the currency, where external demand pulls the economy back onto its feet. 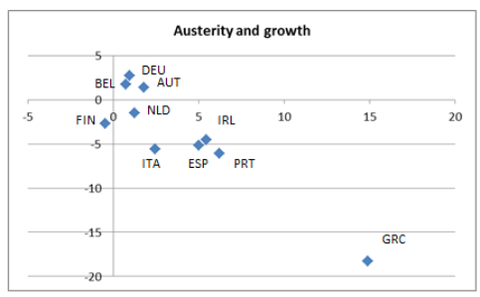 But the main problem across the Eurozone IS ITS CONSTRUCT, one currency “to rule them all”. Greece, nor any of the other GIIPS countries – Greece, Italy, Ireland, Portugal, and Spain – can devalue the currency in order to drive export growth. The problem is that without proper export growth, the internal devaluation would more accurately take the form of “infernal devaluation”. Cuts to nominal income, wealth (via pensions), and other labor variables will restrict current consumption and aggregate spending to a point where such measures then pressure government deficits. It’s a vicious circle, not to mention a fallacy of composition to think that the aggregate can export its way out recession if wages are falling – spending, by definition, must be falling, too. 2. In this sense, the IMF´s advice is to decrease wages and promote privatization of common services. Are we facing the first IMF´s serious intervention in (¿most developed?) the North countries? In that case, what is the aim of these adjustment policies? Do you think they will benefit countries like Greece or Iceland? Or is it just a matter of financial balance and euro´s credibility? Rebecca: The Iceland economy received IMF support in November 2008, but IMF lending comes at the cost of conditional fiscal austerity programs and macroeconomic measures, including trimming the government-funded pension system, reduced wages, and other related budget cuts. Iceland has muddled through, though, because it has something that Greece (nor any other Eurozone country) doesn’t have: a free-floating, non-convertible currency. The Iceland case is very different from Greece (or any of the GIIPS), though, because it issued a lot of debt that is denominated in foreign currency. But nevertheless, the Iceland krona depreciated around 50% against the US dollar between July 2008 and December 2009, driving exports and reducing imports. In 2009, real GDP in Iceland fell 6.5%, the biggest drag came from government spending that shaved 12.2% off of GDP growth. However, the contribution coming from exports and imports was +14.2%, which more than offset the drag from the IMF’s “austerity measures”. Greece doesn’t have this option, since it cannot devalue its currency. Greece can only reduce wages and prices enough to generate internal devaluation resulting in the prescribed export growth. That’s just not going to fly when the Eurozone as a whole is fighting for export income. But worse yet, there’s a positive feedback loop here that will likely result in a debt deflation scenario, normally resulting in private-sector default. Let’s use Iceland, again, as an example. In 2009, private consumption dragged GDP growth a large 7.8%. In Greece’s case, the effect on consumption would be magnified, since without the benefit of external income generation the private sector must take a larger hit. As consumption falls, so too do tax receipts and the primary deficit rises once more – the positive feedback loop. 3. You say it is impossible for all European countries to decrease wages in order to increase exports because –we suppose- this would reduce, in some way, domestic demand and, therefore, trade within the European Union, seeming to be no other way out. How can we get out of this situation? Could it be the end of the monetary union -so that some countries prefer currency devaluation in order to gain competitiveness? Rebecca: It probably won’t be the end of the EMU, but I wouldn’t be surprised if some countries defaulted, which then increases the likelihood of the “end of the EMU”. What we have is an unsustainable situation in the Eurozone, as key countries face “infernal devaluation”. Without an epic surge in export growth, the government austerity programs called upon by the E.U. (or the IMF) will force the private sector to accumulate debt in order to balance out the aggregate forces of income and spending. That’s just fact. The Eurozone was built upon the premise that there would be a unified currency and an un-unified fiscal system. In order to balance the inherent fiscal challenges that come along with inherently different saving motives across the 16 EMU countries, strict rules were set in place: no government is “allowed” to run fiscal deficits in excess of 3% nor accumulate debt in excess of 60% of GDP. Countries are fined, but that didn’t stop them from hiding government obligations from the European Union via sophisticated derivative securities. In the end, you have a band-aid plan to satisfy markets so that Greece can attempt to rollover its near-term debt. This “bailout” comes with no specifics as to threshold levels that must be crossed in order to get the central E.U. players to offer support, which is no doubt by design. Nothing has changed here; no lessons learned; the Eurozone is still just as flawed as it was ten years ago. What has now become obvious to those who did not see this coming, is that the Eurozone, in its construct, was never meant to withstand the financial contagion and ensuing global recession of 2007-2009. 4. The European media are suggesting this week that the European Union should “let Greece fall” as a sign of credibility. What do you think of this issue? Rebecca: Unless the structure of the EMU was changed for the better, meaning fiscal consolidation, the Eurozone would be no more “credible” after the default of Greece. 5. What is your opinion concerning the possibility of creating a European Monetary Fund, which has recently come up in the news? Rebecca: It is an awful idea and ridden with disruptive side effects. In essence, the EMF would be established to prevent sovereign default from causing contagion throughout the Eurozone. If funds are dispersed immediately, the obvious result is the lop-sided power engendered to those countries that contribute, rather than borrow, from the fund. From the get-go, the EMF would generate political pressures from the creditor countries to the unduly strained debtor countries. With such power comes abuse, as illustrated by the International Monetary Fund’s involvement during the Asian Financial Crisis. The IMF proved itself to be highly intrusive into local sovereignty and adopted a one-size-fits-all policy to its conditional lending programs. There is a reason that capital controls are the policy du jour in Asia, and consequently not part of the IMF’s “prescription”. It is NOT unlikely that the same [abuse] would happen under the EMF.